Executing a tactical mission is a dangerous job and having quick access to vital medical gear could be the key to coming home alive. 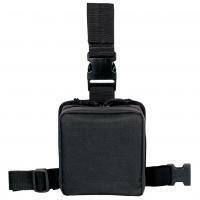 That is why Voodoo Tactical has created the Drop-Leg First Aid Pouch. A reinforced loop securely attaches the pouch to any duty belt, while an adjustable strap holds it firmly against the thigh for reliable carry during vigorous physical activity. A quick-release buckle offers rapid deployment of contents. The full-length zippers allow the case to open flat, providing full access to items without ever having to remove the bag from the leg. A series of internal, sewn-in elastic bands secure bandages, gauze, scalpels and other medical equipment into place for convenient access when needed most. Built to withstand harsh conditions of field use, the military-grade nylon construction and rust-proof, self-repairing zippers guarantee long lasting service life.